Hong Kong IV, from the series, Squares. 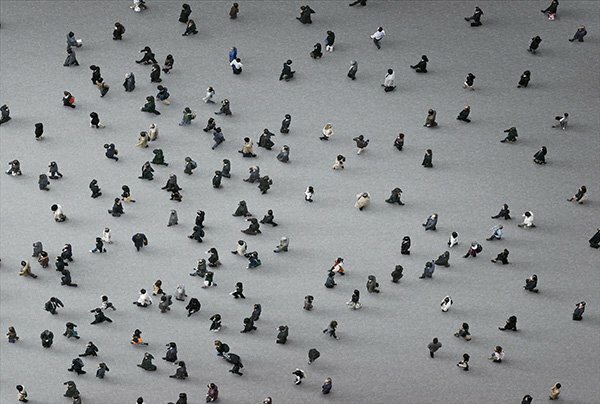 © Adam Magyar. 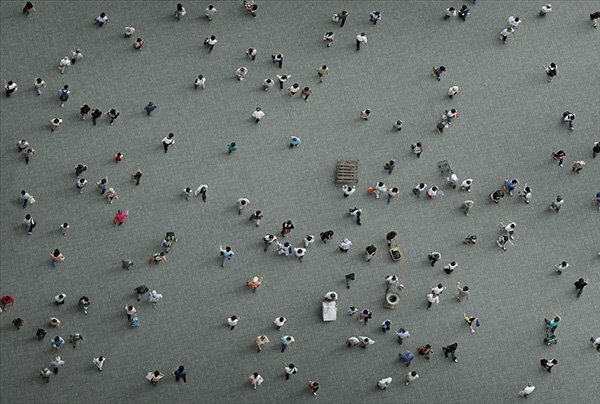 Hungarian photographer Adam Magyar presents us with fictional top-down views of the urban environment in his project, Squares. These images, constructed of hundreds of different pictures using custom-built photographic equipment, allow us to consider the pace and volume of city life from a bird’s eye view. It is through photographs that Adam explores ideas of nature, science, technology and the modern world. Gregory Jones: First off Adam, talk a bit about what drew you to photography. Who are among your biggest influences, photographically or otherwise? 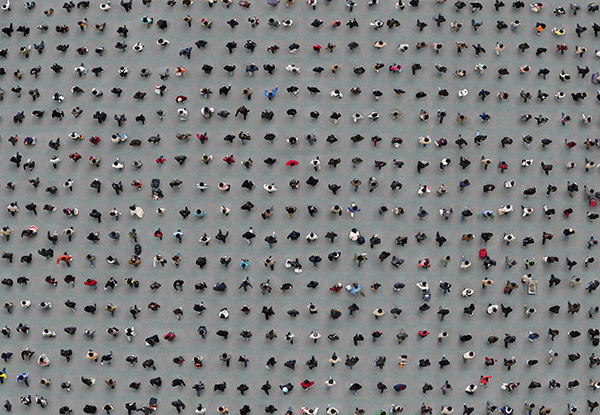 Adam Magyar: Traveling was the greatest influence. All in all, I spent years backpacking alone in Asia. I had a camera like every tourist but the way I used it silently evolved into something else. It happened pretty instinctively, I didn’t receive any photography education and I didn’t even know about other photographers. After 12 years of doing photography, I’m still consider myself horribly uneducated about the works of other artists. But if you ask me to name an artist it is Theo Jansen. His work is on my mind every single day. Tokyo IV, from the series, Squares. © Adam Magyar. GJ: Your project, Squares, offers us a unique view of the urban environment, a top-down expose of various urban characters. Please walk us through the making of this work. AM: The Squares series was a perspective study that I completed quite a few years ago. I started to work on it Shanghai when I got interested in depicting people in infinite spaces taking them out from their personal surroundings, and studying existence in general. I was working on several series at the time, seeking to find out more about this topic. Each Square is a made-up world. They don’t exist in reality. I took pictures from pedestrian bridges of people below one by one and then I put the photos together. Sure it meant solving technical issues, like how to make it look real and how to stay true to the perspective literally. This rather meditative “one-by-one” way of putting the Squares together however also gave me the freedom to give each Square its own dynamism. Tokyo I, from the series, Squares. © Adam Magyar. GJ: In your artist statement, you offer this thought: “I consider all man’s scientific achievements an integral part of human evolution…To me, the city is not less of a natural environment than the rainforest.” I agree with this idea, because we wouldn’t consider a hive to be “bee-made”, would we? There’s one idea of “nature” that is tied to an absence of humans, and another that does not exclude us and our makings. Do we need to find a new term to distinguish the two? Is there anything in this world that is not “natural” in this sense of the word? AM: Well, I don’t mind that there are various perceptions and definitions of this same word. It creates a good ground for discussion. Anyway, I find our urban environment natural, because this is where our evolution and pursuits have taken us. Man realized that the collection and sharing of knowledge, communication, curiosity and persistence would lead to new discoveries faster. That’s our nature. I think the city as we know it today is the natural consequence or manifestation of all this. We are born, we live and die both as individuals and as tiny particles in our man-created structures, may we call that the city or the society. I find this duality fascinating and intriguing enough to continue exploring its different dimensions. And yes, nothing seems to be unnatural in this sense. Tokyo I detail, from the series, Squares. 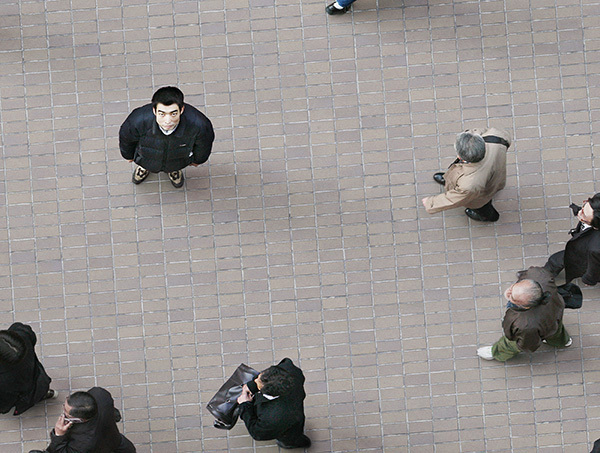 © Adam Magyar. GJ: I pick up a strong sense of scientific inquiry in your work, as you analyze facets of the urban environment in a detached way. In your video, Stainless, you slow time so that we may view human behavior and expressions much as we would study the mechanics of a hummingbird in flight. You have insightfully referred to these figures as “fossils of our time.” The figures in Squares remind me of butterflies pinned to a board, or petri dishes under a microscope, offered up for scrutiny. Would you consider yourself as a scientist of sorts? What aspects of yourself do you feel you’re expressing in these pictures? AM: The image comes first, by which I mean that I work as long as I have it on paper. In most of my works I need use non-conventional technologies, because readily available cameras cannot capture the images I want to make. However, these cameras are designed for industrial purposes, meaning that they are unable to provide an image quality I expect, or are not portable. To give you an idea, I made the Stainless photo series with an industrial slit-cam used for quality control in factories, and the Stainless video with a super-slow motion camera used on production lines. I needed to redesign both systems for my purposes. This redesigning involved having to write programs for both cameras and build hardware around them to make them suitable for my purposes. I had worked months on Stainless just to get a system up and running in an environment – underground with less than ideal light circumstances – in which these cameras were not designed to work in the first place. But to answer your question, I want to show what man and time are like through the lens of state-of-the-art technology, and if I need to use some mathematics and find algorithms to get there, yes I reach for some science. But I’m not a scientist at all, I don’t have that level and quality of knowledge. I can’t reach that high. These technical challenges remain to be tools in the process, like the camera. I need them for the image. In this sense I’m still a backpacker. I need to get my tickets and hit the road, because it’s a journey to get from the image in my mind to the photo on paper or the film on a hard drive. #517, from the series, Squares. © Adam Magyar. GJ: As a follow-up on the last question, your work follows that of many photographers who used the camera for scientific study: Eadweard Muybridge, Anna Atkins, and Berenice Abbot, to name a few. Do you consider yourself part of this group? AM: It’s very honoring you list these great names when you’re talking about my work. But my photographic works definitely don’t deserve such a company. I keep working hard, that’s what I can and want to do. Of course, it would be nice if any of my works would prove to have a lasting value, but I’m not even close to it. If I achieve something that makes me happy and satisfied for a moment it’s all good. Hong Kong V, from the series, Squares. © Adam Magyar. GJ: The pictures in Squares characterize the urban environment in an interesting, minimalist way. The figures’ manner of dress, the concrete foil on which they are presented, and the apparent bustling energy within the frame are the only hints we are given for the context of these pictures. In addition, these images were made in various cities throughout the world. With such little aesthetic variance you use to describe these scenes, you bring the viewer into a generalized space where we are able to consider idea of city spaces without having to consider social, cultural or economic aspects of specific places. What interests you in such an objective and generalized stance? How is this objectivity altered by the fact that these images are constructs, and thus not entirely truthful? AM: Similarly to all of my series, I use very little variance to depict a particular scene here too, because looking at these same scenes repeatedly would urge you to find both how they differ and also what their single essence is, and what that would mean to you. With the “objective and generalized stance” as you put it, I offer the viewer no escapes through distractions. When placed next to each other, they look as if they were images taken from the same scene of a film, and still each has a different feel to it. The Squares themselves are constructs indeed and if objectivity matters they are objective in the sense that I didn’t create a ‘scene’ subsequently that didn’t happen when I took the pictures. In my Stainless photo series and the Stainless video project, I used machine-vision cameras that would enable an even more objective view or approach, however I want these devices only to be the witnesses of our time, enabling us a different view. Yet, complete objectivity cannot be the aim, because whenever I choose a photo of the thousands I make, it will only be a slice of time that I myself have picked. So, my machine vision camera can be objective, but can I? GJ: In describing your work, you talk at length about the idea of time. This has been a popular subject of experimentation in visual art, dating back to Monet’s depictions of the Rouen Cathedral. Time can be stretched, condensed, warped and re-arranged, and our notions of passing time seem extremely relative and uncertain at times. What better medium then, than photography, to explore these notions– especially with the potential of digital media? Your thoughts? AM: There is no better media for exploring time than photography of course. It’s truly a miracle when the light reflecting from reality goes through the device and by the time it hits the medium that records it, it’s already the past. The “analog vs. digital” conversation was still on at the time when I started using digital technology. It was never a question to me whether to go digital or not. But I’m eager to find a true field for digital, and do things that justify using it. I’m very happy that I can make all my experiments surrounded by contemporary devices and the most ancient – not even existing – element: time. Tokyo II detail, from the series, Squares. 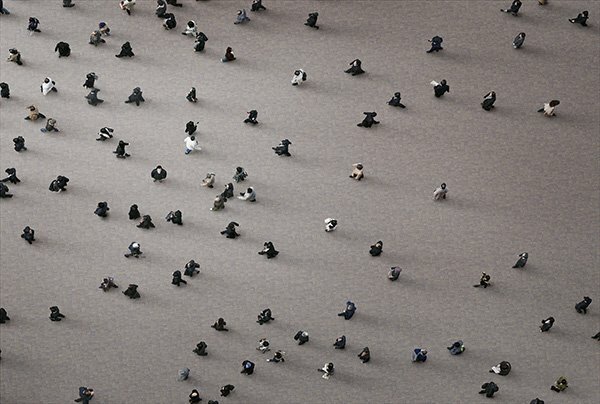 © Adam Magyar. GJ: Last but not least, what’s coming up for you over the next year? AM: My latest project is the Stainless video. I originally made it as an illustration for the Stainless photo series, but found myself captivated by this medium. I am currently working on a new super-slow motion project, but it’s still a long way to go. #7606, New York, from the series, Stainless. © Adam Magyar. #7606, New York detail, from the series, Stainless. © Adam Magyar. 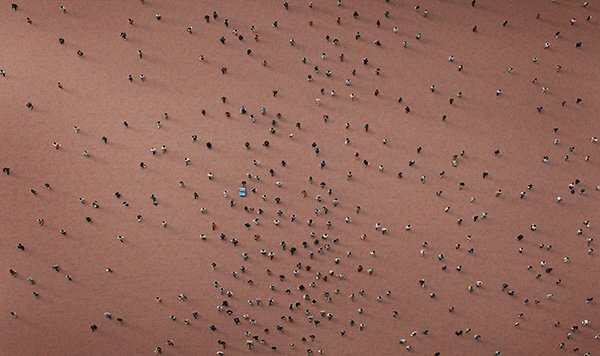 Adam Magyar (born 1972) is a Berlin-based Hungarian photographer. His works have been exhibited in various solo and group shows internationally including Helsinki Photography Biennial in Finland, MFAH Mixed Media event and the Graduate School of Design Harvard University in the USA, Berlin Selected Artists exhibitions in Germany, the Ethnographic Museum Budapest and Faur Zsofi Gallery in Hungary, Rhubarb Rhubarb in the UK and Karin Weber Gallery in Hong Kong. 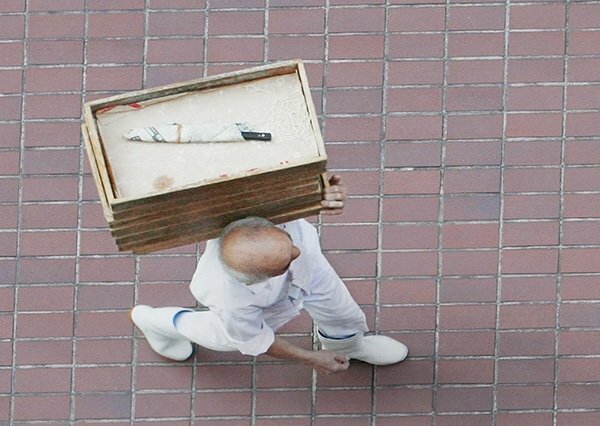 His works are present in the collections of Deutsche Bank, the Hong Kong Heritage Museum and the Bidwell Projects. His photographs have been published in the book In the Life of Cities by the Graduate School of Design Harvard University, Light and Lens by Robert Hirsch, and in photography magazines including PDN and PQ Magazine in the USA, Flash Art in Hungary, Digital Camera Magazine in UK and Katalog in Denmark. 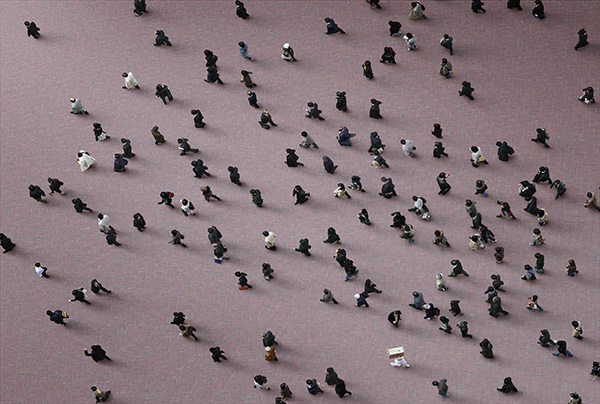 All images © Adam Magyar.